When I wrote my introduction on this site, I mentioned how it was a challenge to celebrate Halloween (and autumn in general) in sunny, Southern California. Well, here we are a few years later and now I’m on Florida’s beautiful Gulf Coast. On the one hand, it’s gorgeous here with blue skies, white clouds and amazing thunder and lightning storms. On the other hand, it’s even warmer than Southern California. While it’s still more of a challenge than ever to celebrate the season, I’m determined to make the best of it. Now that the temps are actually dropping down into the low 80’s (brrrr! ), I’m finding myself peeking my head out of my door and even venturing outside every once in a while. It’s amazing how much more energy one has when they aren’t feeling as though their skin is going to melt off the moment they go outdoors. Decorations went up indoors last week and I’m slowly adding to my outdoor display. The spider pictured above was a fun find a few years ago at a grocery store, of all places. I have named him George. I moved to this little house near the ocean last year and was sad to see that almost no one put up Halloween decorations. It’s a nice, family-friendly neighborhood with nightly gatherings on the beach to watch the sunset while kids and dogs splash in the waves. I figured Halloween would be a big holiday, but it seems everyone goes elsewhere for their trick-or-treating. I only had two groups of kids knock on my door last Halloween night. This year, I was happy to see that there are already more decorations up. Neighbors on both sides of my house, neither of which decorated last year, have put up a few pumpkins and ghosts. One asked for my help with her small display and we are planning to put out candles and lanterns on the night of Halloween and have some fun – even if no kids show up. Well, I’m building it. One spider web at a time. 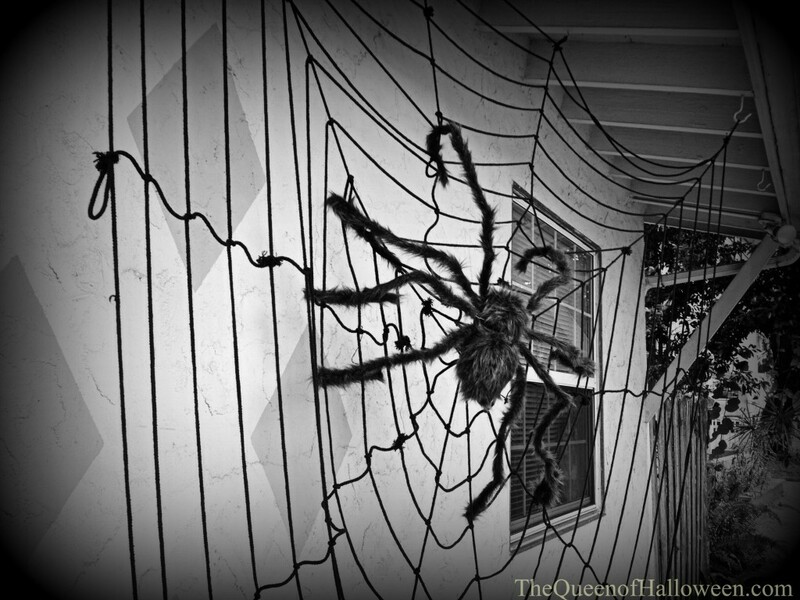 This article was posted in Halloween Activities and tagged Halloween Decorations, Halloween Florida, Halloween yard display. Bookmark the permalink. Follow comments with the RSS feed for this post.Post a Comment or leave a trackback: Trackback URL.